Compare reading buyer’s Digital Body Language to the traditional B2B transaction, a function dominated by sales and rooted in face-to-face interactions. The best sales professionals were highly adept at reading buyer body language and buying signals revealed during in-person meetings, such as business luncheons, boardroom presentations, and product demos. Nuances of facial expressions, eye contact, raised eyebrows, head nods or crossed arms, could tell savvy sales professionals much about a prospect’s buying disposition. He or she could then address objections early to improve the odds of closing a deal. 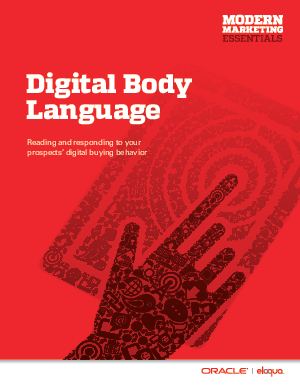 Digital Body Language is the online equivalent of the facial expressions revealed around the negotiating table. It is comprised of web site visits, content downloads, keyword searches, and email responses. In many ways, online buyer behavior provides the most accurate picture of prospect interest and intent. By analyzing the timing, frequency, and clickstream data of web site visits, marketers can zero in on the buyer’s pains, concerns, and motivations. To learn more download this whitepaper. Compliments of Oracle Eloqua.